POSTED December 27, 2018 11:16 a.m.
POTOSI – With wins last week over Iowa-Grant and Belmont, coach Mike Uppena’s Chieftains improved to 4-1 on the season, and 2-0 in Six Rivers West conference action. The Potosi boys headed into the holiday break sitting second in the Six Rivers West conference standings behind Shullsburg (4-0, 5-2), and just ahead of Benton (2-1, 5-1) and River Ridge (2-1, 2-4). In last Friday night’s conference contest against visiting Belmont, the Chieftains turned a 44-24 halftime lead into a 79-37 victory. Coach Uppena got a team-high 15 points, five steals and four assists from senior Brady Curtis, who went 7-of-10 from the field and 1-of-2 from the free throw line. Junior center Nick Edge chipped in 14 points, seven rebounds and two blocked shots, while fellow juniors Ty Dressler added 13 points and Ryan Kruser 10. Junior Ben Udelhofen pulled down a team-high eight rebounds to go along with four assists and four points, while Kruser also had five steals. As a team, the Chieftains made 33-of-67 (49%) shot attempts, including 3-of-14 (21%) from 3-point range. They were 10-of-20 (50%) from the free throw line, committed 15 turnovers and came away with 17 steals. Potosi scored 48 points in the paint compared to Belmont’s 18, and scored 27 points off turnovers to Belmont’s two. The Braves were held to 10-of-36 (28%) shot attempts, including 1-of-12 (8%) from long range. They were 16-of-22 (73%) from the free throw line, and committed 28 total turnovers. In non-conference action last Thursday night, the Chieftains jumped all over visiting Iowa-Grant to take a 42-14 halftime lead, which led to a 78-50 victory for Potosi. Curtis led the Chieftains with 17 points and four steals, while senior Will Bierman and Kruser each had 12 points. Bierman also had a team-high six assists, while Kruser had eight rebounds and five assists. Nick Edge also had eight rebounds and two blocked shots to go along with nine points, while Ben Udelhofen had a team-high nine rebounds and four points. On the glass, coach Uppena’s squad out-rebounded the Panthers, 43-27, scoring 32 points in the paint to 18 for Iowa-Grant. Potosi knocked down 31-of-61 (51%) shot attempts, including 7-of-15 (47%) from 3-point range. They were 9-of-17 (53%) from the free throw line, committed 15 turnovers and came away with 12 steals. The Chieftains are off until Thursday, Jan. 3, when they travel to Shullsburg to take on the league-leading Miners. Iowa-Grant - Hubbard 18, Winders 10, Hill 8, Kitelinger 6, Kohlenberg 3, Kuhls 3, Lundell 2. Totals - 16-49, 14-20 50. Potosi - Brady Curtis 17, Will Bierman 12, Ryan Kruser 12, Nick Edge 9, Austin Uppena 7, Ethan Groom 6, Ty Dressler 5, Ben Udelhofen 4, Nelson Bauer 3, Gunnar Stappert 2, Jaydon Carbone 1. Totals - 31-61, 9-17 78. 3-point goals - IG: (4-17) Hubbard 1, Hill 1, Kitelinger 2; P: (7-15) Curtis 2, Bierman 2, Kruser 1, Uppena 1, Dressler 1. Team fouls - IG 17, P 24. Fouled out - None. Belmont - Colin Austin 8, Luke Kamps 8, Ethan James 7, Justan Ernst 5, Kolton Westemeier 5, Palzkill 2, Mitch Douglas 2. Totals - 10-36, 16-22 37. 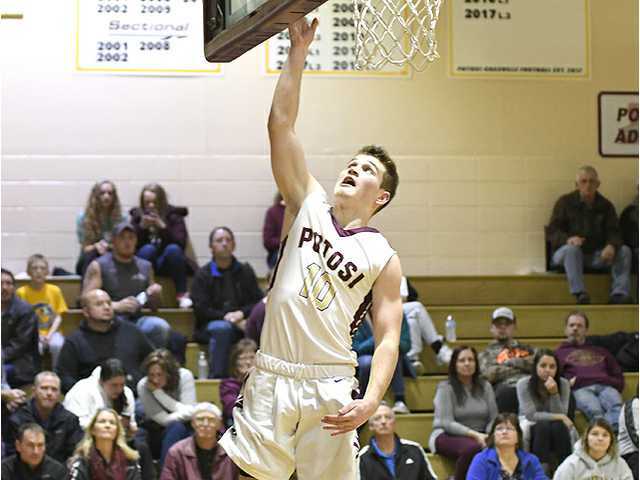 Potosi - Brady Curtis 15, Nick Edge 14, Ty Dressler 13, Ryan Kruser 10, Will Bierman 7, Ethan Groom 6, Ben Udelhofen 4, Austin Uppena 4, Nelson Bauer 3, Jaydon Carbone 2, Gunnar Stappert 1. Totals - 33-67, 10-20 79. 3-point goals - B: (1-12) James 1; P: (3-14) Dressler 1, Bierman 1, Bauer 1. Team fouls - B 19, P 19. Fouled out - None.